We had a great time celebrating Jonas' first birthday! My mom, step-dad, Bruce and my aunt Candy all traveled down for the party. They came early on Friday so we had a chance to do some fun things before the party. 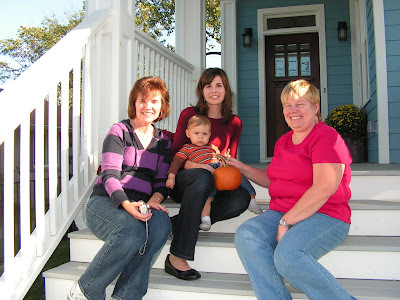 The fall weather hit so we enjoyed time on our porch while they were here. 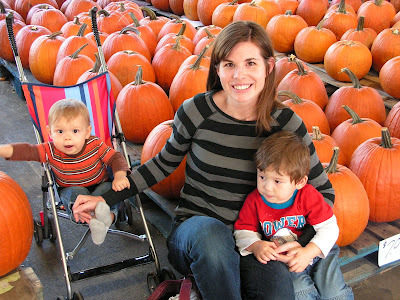 We also took them to the Farmer's Market (just a street over from our house) to look at all the fall flowers and pumpkins. 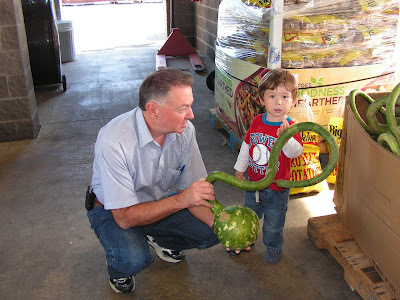 Bruce and Asher found this monkey's tail squash. 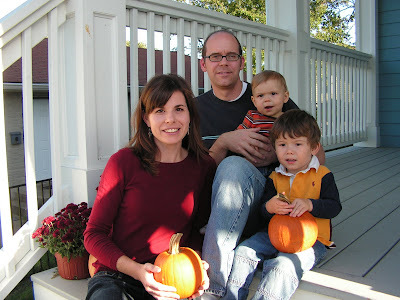 There were rows upon rows of pumpkins in any size, shape and color you can imagine (okay not blue and gold---David was hoping to decorate the front of our house with Notre Dame colored pumpkins!). Jonas had to touch every one his little arm could reach from the stroller. Here is one of our few family pics. The birthday party was on Saturday and it was a combined party with our niece, Katie (David's sister, Julie's daughter), who was turning two. Yes, I went into labor at Katie's first birthday. It's so fun that they share the same birthday! 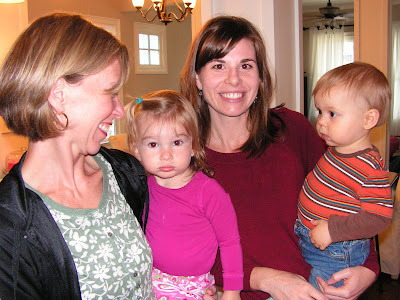 Below are the moms with the birthday kids. Since we had two birthdays, we had two birthday themes and cakes (and yes, I was crazy enough to make both cakes, including an individual cake for Jonas to eat). 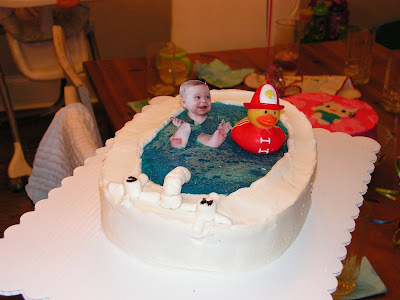 Jonas' birthday theme was bath time (his favorite thing right now). So here was his cake. 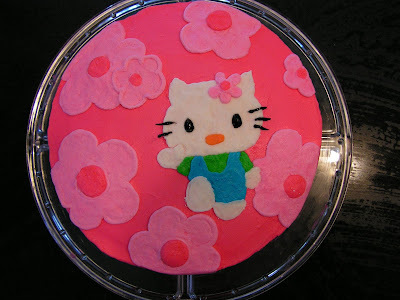 For Katie, we had a Hello Kitty cake. 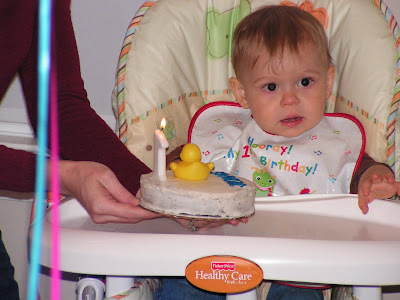 You can tell it's Jonas' first birthday because he was just looking at us all strangely, while we sang to him and then didn't quite know what to do with the cake in front of him. I had to get him started with eating it. 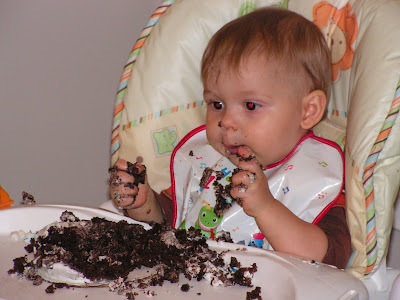 He quickly got the hang of it and devoured most of it. I was surprised how clean he stayed. Katie knew just what to do after we sang happy birthday to her. 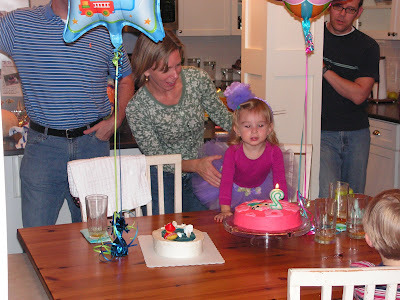 She just leaned right over and blew out the candle like she had had many birthdays before. 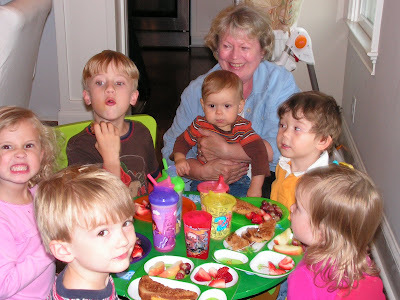 Below are all the cousins (minus Skylar) with Nana at the kids' table. It was such a special day to enjoy with some of my family and David's. Most of David's family were there--Greg, Angie, Elijah, Meadow and Skylar; Steve, Julie, Luke and Katie and Nana--all that is except Pops. We missed you Pops! We look forward to celebrating many more shared birthdays. I can't believe he's already one! I love his birthday cake. You have a lot of talent and creativity in that area! that cake is hilarious!!! what a great idea. i can't believe he's one either!! !